Find the lowest prices on drum crushers at Material Handling Solutions LLC. The model HDC-905-IDC crushes 55-gallon steel drums to approximately 6” high and resets automatically to crush another drum. Full cycle time is 25 seconds (crush and retract). This unit is designed for a duty cycle that will allow for crushing or compacting up to 250 drums per week in a typical non-hazardous, indoor room-temperature environment when operated on a three-phase power supply. 38,000 pounds of crushing force. The included drum compacting feature allows you to compact contents inside the drum by simply removing the drum crushing platen. 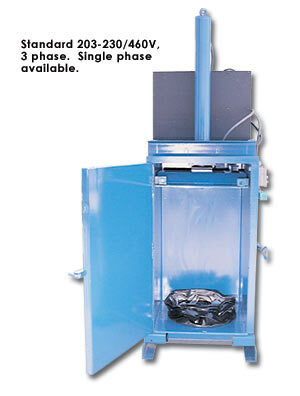 Crushing feature will work with any drum size up to 55-gallons. Compacting feature will only work with 55-gallon drums. This convenient design gives you two pieces of equipment in one. Safety features include a pressure relief valve, which prevents overload, and a double door latch to secure the door when crushing. Plus an interlock system that will prevent the motor from running unless the door is closed. 6.5 hp motor, 3-phase, 60 hz, choose from 208V, 230V or 460VMeets OSHA 1910.212 and ANSI Z245.5 standards. Built-in fork pockets aid in transporting. Aluminum drip pan, for catching any excess liquid that may be expelled during the crushing operation. The pan holds 1 gallon and measures 31-1/2"W x 4-1/2"L x 1-5/8"H. Material Handling Solutions is a large distributor of material handling equipment, industrial supplies, office furniture, office supplies, and office electronics.